"How Will You Rule Your Galaxy?" This is Part IV of the Galactic Civilizations III – How To Win series. We’ll be finishing up with the final turns (11- 20) and some suggestions for you to consider along the way. This map shows you how things stand at the beginning of this article (Turn 11). You can see that we are focusing on colonizing the planets at the outer fringes of our territory. You want to do this in order to expand your territory and also to keep the other Civs from scarfing up those planets. Every planet you get strengthens you while weakening them. Once you locate another Civ, aim to colonize the planets in their direction. Work your way from the farthest planets inward, towards your territorial center. This will cause a disadvantage for them because they will have to travel further to colonize planets. All the while, you will have to travel shorter distances to accomplish the same. Cool! This will become all the more advantageous when you are later able to afford faster Colony Ships. I also indicated the Sable Scout Ship, purchased from the Bazaar earlier, if for no other reason than to emphasize the massive swaths of visibility a good Scout Ship can bring to the game. Getting one of these powerful ships working for you in the early game is a huge boon and should not be overlooked. 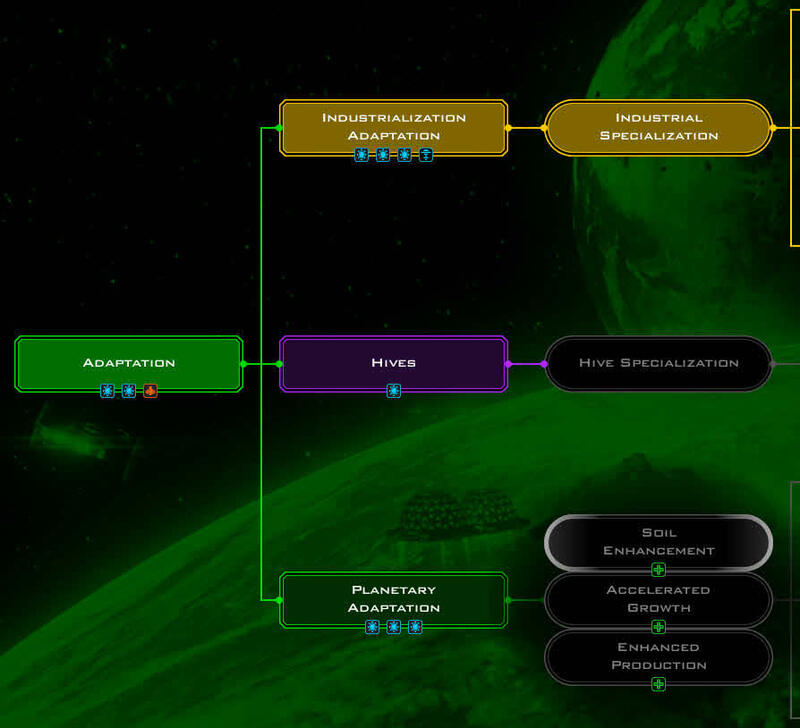 If you plan on trading with the other Civs, then it might be a good idea to own a specialized Trading Planet. By doing so, you can get a lot more gold per turn once your trade routes have been established. Note: I don’t worry about money in GalCiv III, but having Trade Routes with a a few hard-to-please Aliens will help to keep them happier. Trading boosts your Diplomatic relations with them, and that is the main reason I use them. There are several Hyperion technologies that you’ll want to get Early to Mid-game. Sometimes it is not possible to place them properly on your Home World– you simply don’t have enough room. In the best-case scenario, you will build these improvements on a planet with a Military Bonus, on adjacent tiles, with the Shrinker on a Military Bonus Tile. Note: I don’t remember where I saw it, but someone once went to the trouble of comparing ships built with and without the effects of the Hyperion Shrinker. The results were striking and clearly demonstrated that utilizing one of these buildings was well worth the effort; much more powerful ships could be built as a result. The AI uses Diplomatic Trading to get most of its Techs throughout the game and you should, too. The last thing you want to rely on is actual Researching. Trade for the important, expensive Techs, and use Research points to get the Techs you can get quickly (under 10 turns). Don’t forget those all-important Artifacts and Capsules scattered all over the map. I have no hard evidence to support this, but it seems as the game progresses that the Artifacts become more likely to produce free Techs. Turn 15 is pretty late to be meeting your first Major Civ. Given that there are only four Civs on this map, I guess it shouldn’t come as that big of a surprise. Once you’ve established Open Borders with each Alien you meet, then you can start bartering for those Techs they have. I finally got my second Survey Ship. Turn 20 is way late to be getting this important ship. Do not follow my lead here and wait this long. 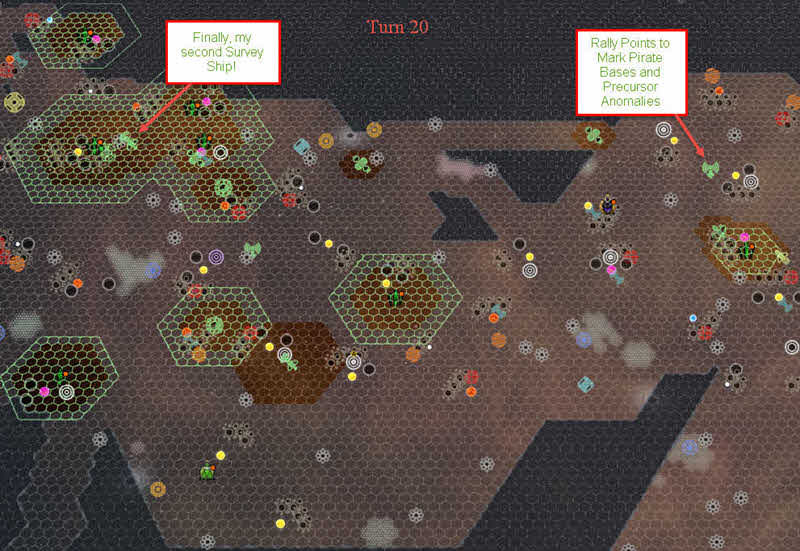 You should have two Survey Ships on the map by turn 10 if at all possible. They are vitally important not only for exploration but for finding all that free stuff (Gold, Ships, and Techs). Rally Points are useful for more than steering ships and fleets to points on the map. When you’re on the wrong side of 60, it helps to use them as markers so you don’t forget where those Pirate Bases and Precursor Anomalies are. Once you’ve routed the Pirates, simply delete the marker; same with the Precursors. As weak as Pirates are, they can be as deadly as Pawns on a chess board if you ignore them. Let’s say you’ve just sent a hard-earned Colony ship on a 15-turn trip to a high-quality planet. What you don’t realize is that its path comes within a couple of tiles from a Pirate Base right around turn 13. Then, out of the blue, your pitiful Colony Ship is easily destroyed and you’ve just wasted a whole ton of time and resources. Now you’ve got to build another one, send it on that long trip, and hope the whole while the enemy doesn’t get to that planet before you. Over 30 turns to maybe accomplish nothing. That’s why I use those Rally Points as reminders of those lurking dangers. By this time you should have a basic system in place, that is, a series of steps you take each turn. This can be in any order that pleases you as long as the main goals we have discussed are achieved along the way. By turn 20, given how poorly the AI colonizes the map, you should have as many, or more, planets than any AI on the map. In all fairness, Stardock has worked very hard on the AI and it has gotten much better at colonizing in recent versions of the game. By turn 45 I start looking towards picking up some Weapons and Defensive Techs. You will probably have other Techs that are more pressing at the moment, but keep the Military stuff in mind.This is in preparation for the inevitable, “You are ripe for conquest”, messages you’ll be seeing all too soon. Grab basic Military Techs through trade if you can, and get the rest via Research. By turn 60 you should be able to build at least a few small military ships/fleets to make the Aliens think twice about attacking you. By turn 75 it is very likely that at least one of the Civs won’t like you anymore. If they see you as weak, they will eventually attack. It doesn’t take much to keep them at bay, however. If you can pump out a few Military Ships with a high Attack rating, that is often enough to stay their forces. From what I can tell, the AI uses the combined Attack points of your ships compared to theirs to determine relative strengths. Even a single powerful Survey Ship is often enough to cause them concern. It doesn’t matter that they could easily defeat that Survey Ship; it’s a flaw in the AI mechanics. If I was a betting man, I’d say Stardock will address this AI weakness in the near future. Abuse it while you still can. You’ll know by turn 100 whether you’re winning the game, or not. If it is a pretty evenly matched game at this point, then it becomes imperative that you find your opponents’ weaknesses and exploit them to the best of your ability. You should be able to build any type of ship you need in a turn or two at your Home World. If you have another group of planets with high manufacturing rates that you can turn towards ship building, you might want to specialize. Maybe use your Home World for Military and another Shipyard for more Colony Ships and Constructors. Sometimes, the Colonization Phase never truly ends. On really big maps it’s possible to own 100 planets or more. Each game is unique so there is no way for me to advise you in a general way. As each game is unique, so too, must be your strategy. If you’ve read through this entire 4-part series, then I commend your steadfast nature; it’s been a long trek. I can only hope you’ve gotten the information you were hoping for and this guide has proven useful to you. As always, any questions and/or comments are always welcome. I will do my best to respond in kind. 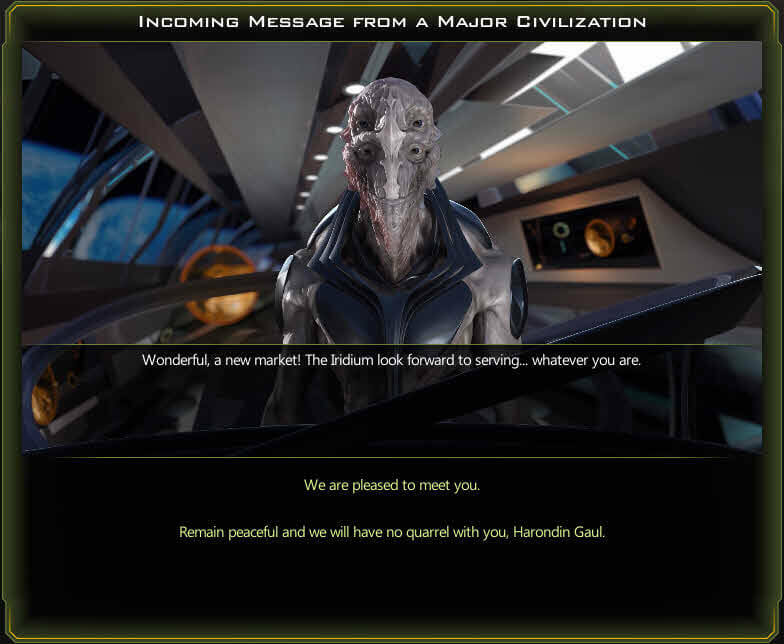 Galactic Civilizations III is an awesome game. If you like Space and turn-based 4X games, then this is a great choice for you. Richard, just wanted to thank you for writing this series of posts – they have been incredibly valuable for someone trying to pick this game up and make sense of the various systems within this game! I thank you for this interesting guide. I tried it step by step but there were major differences, so I have a few questions, like, what were the settings for factors like habitable planets, minor races and such. I know the comment section is not the place for discussion, is it, so should we do this via e-mail? I have all the planets, anomalies, etc, set to the middle position. Can’t remember the name of the settings right off the top of my head, but basically choose a middle ground. I like to bump the setting for Minor Races a notch because of all the cash they can generate for you. This can be important in the early game. Comments is a fine place for simple discussion. If it gets too complicated, then moving it to a spot in the DCT Forum might be better. This was so incredibly helpful. I am not one to comment on a video or article but this was so worth it. Thank you for the (not doubt) extensive time you spent organizing this and getting as much information out with as few words as possible (quite the Everest for a game like this). This is a rather old article now considering how many expansions have been made for this game. Much of what I discussed in this post won’t be very effective in the new Crusade update. The whole system has been changed.